● GREENS - Literally dozens of species of green vegetation make up the bulk of the bears’ diet, in terms of total weight consumed. Nutritional value may be less than many other foods, but at the time of consumption greens are clearly the best choice for the bear. A few preferred ones are aspen and beech buds in early spring, sedges, clover, and jewelweed. ● BERRIES - Strawberries are typically the first berry available to bears in early summer, and are high in carbs. Raspberries are also a very important source of carbs and are quite well distributed across bear range. Blackberries are not readily available across large portions of Maine. Blueberries are not well distributed over parts of Maine, but are a clear bear favorite where available. Bristly Sarsaparilla, sometimes called “bear berry”, is especially prominent Downeast, and bears focus intently on them for a week or so in late summer. Wild cherries (primarily chokecherries and pin or fire cherries) are a favored food. Mountain ash berries are a very important late fall food when abundant in the northern part of the state. Cranberries are the latest (time-wise) of the preferred berries. Apples, both wild and cultivated, are also very desirable, although few bears have access to them. ● INSECTS - Colonial insects and their eggs or larvae, primarily certain ant species but also bees, wasps, and hornets, are an important bear food. Insect larvae is high in protein, and very digestible. The honey in a beehive is valuable to bears, but the brood comb containing the developing bee larvae is also a target. They also eat many species of non-colonial insects and grubs, like June bug larvae that are particularly abundant during some years under the sod in lawns. ● HARD MAST – Wild mast is an important food, but crops often vary from year to year and place to place. Beaked hazelnuts are well distributed across Maine’s bear range, and beechnuts are readily eaten, but are not a reliable food source, as many years very few are available. Also, many of our beech trees are succumbing to a bark disease. Acorns are available as an alternate to some bears in Maine. ● MEAT - Meat is a high energy food, and bears take advantage of it when available. Scavenging winter-killed animals is their greatest opportunity, but they must compete for this resource with other scavengers. We know they prey on deer fawns and moose calves, and also preyed on at least some of the fully grown caribou released by the Maine Caribou Reintroduction Project. Livestock are also sometimes killed but cannot be considered a significant source of food for most bears. The importance of meat sources like beaver, birds and their eggs, frogs, turtles, etc., is not well understood but contributes to most bears’ diets. ● CROPS - Sweet corn is very attractive to bears as well in late summer, but like apples, many bears will never see an ear of corn. Oats are a more commonly raided grain crop. 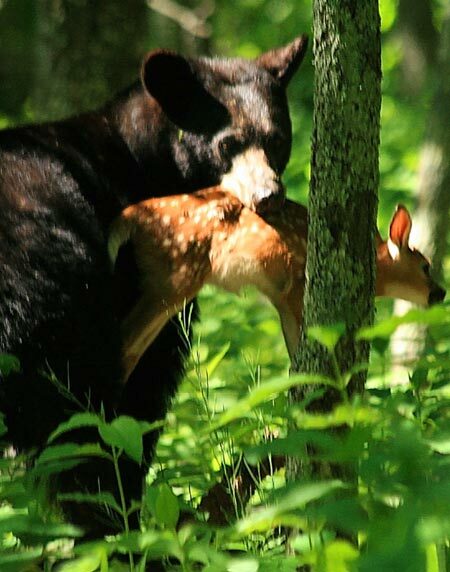 Although black bears are omnivorous and eat large quantities of vegetation, they will eat meat when the opportunity arises, and routinely prey on deer fawns and moose calves. Naaman Pratt photo. When considering bear diet, the formula to remember is: bear habitat = bear food. You can replace the word habitat with food. We measure the health of habitat by weighing cubs and yearlings in the winter den. The natural food production in the North Woods has been very impressive over the last 10 years. Yearlings weighed in dens averaged less than 40 lbs in the first 15 years but have averaged over 40 lbs in most of the last 10 years with some individuals exceeding 60 lbs. The spruce budworm infestation of the late 70s and 80s was the initial triggering factor in the change. It killed and defoliated huge expanses of fir, letting light in on the forest floor, which triggered the growth of vegetation that was also good bear food. In an attempt to salvage the dying wood, timber companies cut vast expanses of forest, including many other species besides fir. The result was an explosion of new vegetation, and ant colonies in wood rotting on the ground, across millions of acres. All this extremely abundant new bear food along with conservative harvests caused a corresponding rise in bear populations. This rise is still continuing. Without control of their growing numbers, bears will eventually increase to where they have expanded into all available habitat, including southern Maine and the suburbs, will consume all available natural food, and will suffer from starvation, disease, cannibalism, and fighting. They will also be in chronic conflict with humans. A generation ago, bears had a negative value. They were considered pests because they destroyed corn and blueberry crops, beehives, apple trees, attacked livestock, etc. When the bear hunting business became more popular, it gave bears positive value; they were considered a prized game animal. Hunters gave bears value.